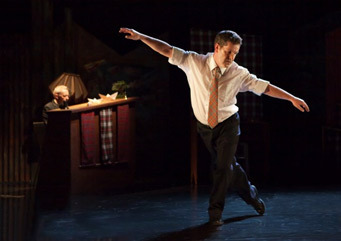 A highly charged and compelling dance-theatre piece, A Wee Home From Home explored the dizzying emotions and memories that one man’s homecoming can provoke. Told with affection and wandering through other familiar territory that would rather be forgotten, the show was a roller coaster ride down an unpredictable memory lane. Frank McConnell’s inspired and well-observed choreography perfectly partnered the caustic and heart breaking observations contained in Michael Marra’s exceptional live music. Directed by Gerry Mulgrew.